My new Silverado was stuck in 4WD. The dealer found a Chevrolet "Field Action" for the vehicle that indicated the transfer case shift control module required reprogramming. The "Service 4WD" message appeared on the driver info screen. Some of the vibration issues being reported could be that the truck is stuck in 4WD - that causes steering wheel vibration at highway speeds. In my case, the control knob was in 2W HI and there was NO indicator light on the knob. The service 4WD did not come on initially. I drove today approx. 200 miles with Auto setting due to black ice this am. I came home tonight fine and parked in my driveway for a few hours. I tried to backup in to my turn around and noticed immediately. that it was in 4wd, yet the dial stated 2wd. I tried the dial with no effect. I also saw a service 4WD error on the display. Have others had this issue? Does anyone have more info on the field report referenced above? Yes. Cold temp is screwing up the tccm. Take it to your dealer to get reset, and wait for permanent fix from gm. Dealer told me to put the truck in 2wd before shutting off, only codes in auto/4wd on startup. So far so good. Mine is stuck in 4 wheel drive. Reprogramming didn't help, it lasted a couple of hours! After the reprogram it flagged the alarm again while I was driving with it in 4hi. Contacted GM last week but they have not gotten back to me! Trying to back in of dry pavement is brutal and I'm just causing more damage! 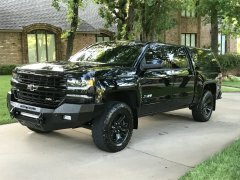 Come on GM.....fix my truck!! Reprogramming on mine lasted 8 days before the service 4wd light came on and it locked in 4wd again..... Back to the Dealer again. Another couple months and we won't need a fix till next December! I'll never remember to put that back in 2 wheel drive after every trip! But I still loves my truck! So did GM not test these trucks in below freezing temperatures? I'm really curious as to how this could possibly happen. Wow! Can't handle the cold? What a joke. Mine just started acting up since having the transfer case recall done. I'll have to try the 2wd shutoff option and see if that helps. GM has never been the leader in vehicle electronics technology. I recall when these 14's first came out reading about numerous starter issues and power steering issues due to freezing temps. Sad to hear now there are 4WD issues as well due to the electronics. One can assume GM proving grounds are somewhere in Arizona only where they're road tested for a week then sent into mass production. You can assume that if it makes you feel better some how, but you'd be wrong. Same thing they told me. Shutting down with 2wd selected didn't do anything for me. Still stuck in 4. I got a service appointment for Friday so we'll see how that goes. I am sure this issue has been beat to death multiple times, but I cant find the answer. I have a 2005 Silverado 1500 z71, I have had this issue for about 2 years now. the issue being that no matter what part I replace my 4wd wont reliably work. here is a list of what parts have been replaced. So what is happening is, the dash will read service 4wd, i have taken it in to a shop where they have been replacing the parts, and i have come to the conclusion they are just throwing parts at it to find a fix. Every time they would replace a part it will work about 2-3 days but then give me the same service 4wd message. if i push one of the 3 4wd buttons on the switch the light will blink for a while then stop and it seems like it doesn't shift into 4wd. But i have crawled under the truck while someone else selects a 4wd button, I can hear and feel the transfer case changing into to 4wd mode. but the front diff actuator does not engage. I have checked and cleaned the ground wire under the drivers door twice but that doesn't seem to help. I am done throwing money at the shop to fix it, so this is my last resort. I got a 2016 Lifted (6 inch) Diesel Colorado with a 6 foot bed at the end of October. Since then I ran into an issue where you can hear a knocking noise from the front end when you turn while its in 4WD. I took it to the dealer and they have been trying to fix the issue but its going on 6 weeks (they had it for 3 weeks trying to fix the remote start before that). They thought they fixed it with a new axle, one CV (? ), new fabricated spacers, and tilting the transfer case i think.. I got it down to the end of the service entrance and it made the noise again when I turned. What can it be? Today they tried to buy me out by offering me a new trail boss (very base model) and I would have to pay more than I am now and not have the bells and whistles my current one has (if I ever get to drive it). I’m not the handiest mechanic around so I ask you try your best to simplify your answers. First off, I have the four button 4wd and 4HI, 4WD Auto, and 4LO flash endlessly when I hit them, while 2HI stays solid. 4HI and Auto does nothing, no feeling or sound of engagement or anything, just flashes till I switch it. 4LO flashes but I feel and hear the clunk and it seems to have more torque. Any ideas where to start looking?